Kit Miyamoto at work in Mexico City. He says New Zealand has vulnerable buildings similar to many of the 40 that collapsed in Mexico’s 7.1 earthquake last month. Wellington needs to heed warnings from Mexico City’s recent earthquake because the two capitals have important features in common, an industry expert says. 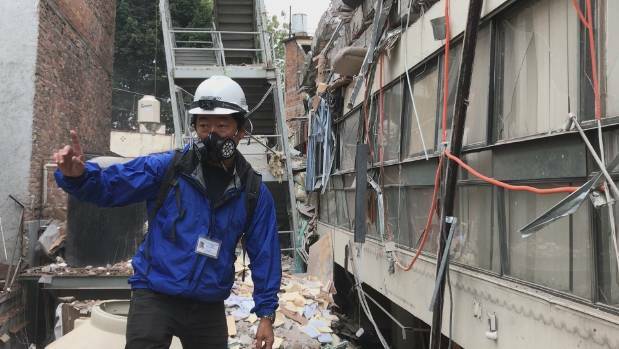 Kit Miyamoto, head of structural engineering firm Miyamoto International, has been in Mexico, helping with recovery efforts after September 19’s 7.1-magnitude quake, which killed 370 people, and caused the collapse of more than 40 buildings. He worked beneath one of the collapsed structures, and said it reminded him that New Zealand had similarly vulnerable buildings. Statistics House, on reclaimed land on Wellington’s waterfront, will have to be demolished after it was damaged in November’s Kaikōura earthquake. Kevin Stent/Fairfax NZ. His New Zealand-based colleague David Weir, who has been receiving technical reports from Mexico, said it was wrong to assume that, because Wellington buildings survived the Kaikōura quake, what happened in Mexico City would not be repeated here. 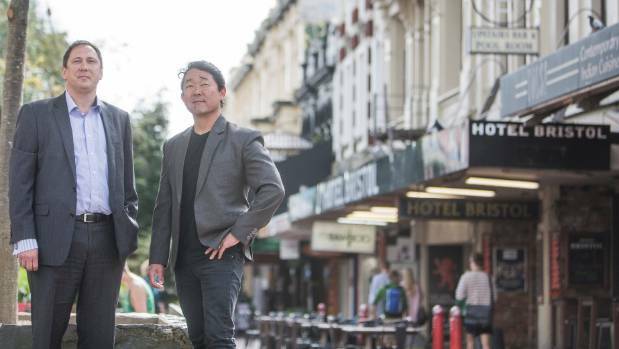 “Wellington has a lot more in common with Mexico City beyond the fact that both are capital cities – both are near big faults, and both have areas built on reclaimed land,” said Weir, who is chief executive of Miyamoto NZ. His warning comes just as CentrePort, the owner of Statistics House, confirmed the building would be demolished because of damage sustained in November’s Kaikōura quake. 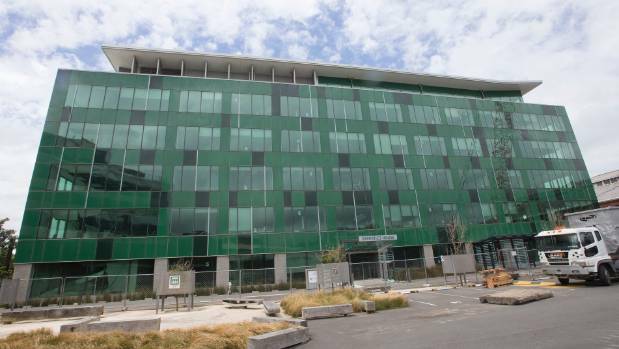 The five-storey Wellington office building, on reclaimed waterfront land, has been empty since two floors partially collapsed in the quake, prompting a government inquiry into building standards. The fact that many Wellington buildings escaped the quake unscathed did not make them safe from future shocks, Weir said. They survived only because November’s was a long-range quake. A closer one, such as Mexico City’s, would have toppled them. “Buildings that survived the 1985 quake in Mexico City came down this time because, although the quake was smaller, the epicentre of the earthquake was less than half the distance from Mexico City. With less than six months to go before a Government-imposed deadline to secure parapets and facades on 98 high-risk, unreinforced masonry buildings (URM) in Wellington, work is yet to be completed on any of them. Weir said he was worried that building owners would leave it until the last minute, and cause a spike in demand that could not be met by the engineering industry. Cost-effective strengthening solutions that would increase the value of buildings, attract tenants and reduce vacancies were available, and owners should get on with ensuring public safety, he said. In May, Miyamoto International and Deloitte published a report that estimated a quake of a similar magnitude to Christchurch in 2011 would cost New Zealand at least $29 billion, and $26b of that would be in the Wellington region. New Zealand Society for Earthquake Engineering president Peter Smith said there was no question that Wellington was very fortunate after the Kaikōura quake. Wellington City Council chief resilience officer Mike Mendonca , who has been to Mexico City twice to look at earthquake issues, said it was unknown what would happen to Wellington, but the city needed to do all it could to mitigate the effects. By March 31, the date of the URM deadline, Wellington would be in a much better place, he said. A GNS Science spokesman said there were more differences than similarities in the seismic settings of Wellington and Mexico City. The tectonic subduction zone near Mexico City was faster-moving and produced more damaging earthquakes than the equivalent subduction zone under Wellington. The built environment in Wellington was also more resilient than that of Mexico City.